The Socrates studios all have sea or mountain views and have been modernised. On site there is a taverna run by the owners serving many home cooked dishes. The beach of Skala is just a 10 minute walk away where you will find many bars and restaurants. 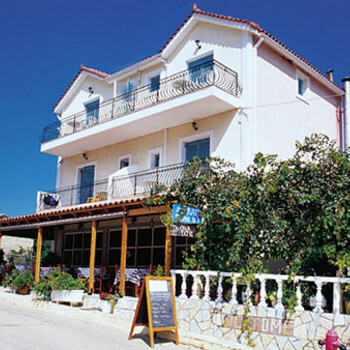 The Socrates has pleasant, helpful owners and a decent taverna. It is, unfortunately, situated in a very noisy position between two right-angle bends and the traffic noise from very early morning (it is on a Scala through-road) is horrendous. We were in Room 2, a front room and barely had a good night's sleep for the two weeks we were at the Socrates. Olympus do mention "some noise" from the road and taverna, but this was more than "some"! There was no noise from the taverna. The cleaning was of a regular and high standard, but we arrived to find our room floor flooded around the 'fridge. The room needed some t.l.c. Mossies were regular visitors.